This is our 5th year here at Cozy Cove Cabins and every year it is the same, peaceful! The cell phones don-t work here. My husband spends the days hunting while I read, crochet, or check out the wonderful town. I even went to Canada and shopped at Wal-Mart, it was only about 30 min from the border. Every night we eat out-MAMA BEARS, FOUR SEASONS, and we even tried a new pub and grill down the street, it even had a popcorn machine and a flat screen TV you can watch the football games. Written by Rose Bailey who stayed here with her son and husband. She passed away in 2007 so this was her last stay in Jackman and entry into our journals. Hunters Supper was last Thursday and as always, a great success. We even had a dusting of snow this week in town. I think there was much more in the mountains though. We went into St. Georges yesterday and at the border, there was more snow and by the time we hit St Georges, they had about an inch. They must be a little higher altitude than us. I know we are thankful for the cold weather 😛 and look forward to a snowy December! November is coming to an end and the winter season of fun in Jackman is about to begin. Starting off this winter in Jackman is a Sled dog race, the 1st one being in December. They are also sponsoring a dinner – auction that night of December 9th at the Clubhouse. Lots of food and fun for all and the proceeds go to the Sled Dog Club. For tickets or more information, please call ➡ Beth at 207-668-2042. The first race is the Moose River Run scheduled for December 9-10. The second in Jackman is the Plum Creek Challenge on January 6th and 7th. Then finally, the Northeast Championship is scheduled for March 2-4. These Dog Sled races draw Mushers from around the world including world gold medallists so whether you are a participant or a spectator, there is lots of fun for the whole family. Although you cannot be on all the trails to watch these wonderful animals and their Drivers (Mushers), there is one area we have gone that you can see them in action. Another option is the club invites anyone to join them to work on the trails where you can really have an opportunity to be up close to the race and see the “”on- trail”” action. Or go to the Border Riders Clubhouse and you can be right in the middle of the excitement at the start and finish lines. Then when you need to warm up, have some laughs in the clubhouse, get a snack and listen to the stories the drivers may tell. Another part of these races that I enjoyed is the Scandinavian sport of Skijoring. The dogs pull their driver on skis, no sleds involved. Originally, these skiers were pulled by horses. I am not sure which would be harder!! All Races will be held at the Border Riders Sportsman Club in Dennistown, just north of Jackman. 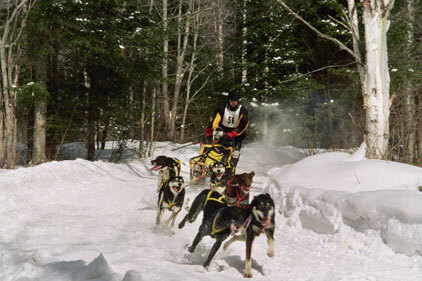 The sled dog races in Jackman are organized by the [url=http://cozycovecabins.com/maine-outdoor-winter.php]Jackman Sled Dog [/url] Club and the Down East Sled Dog Club. 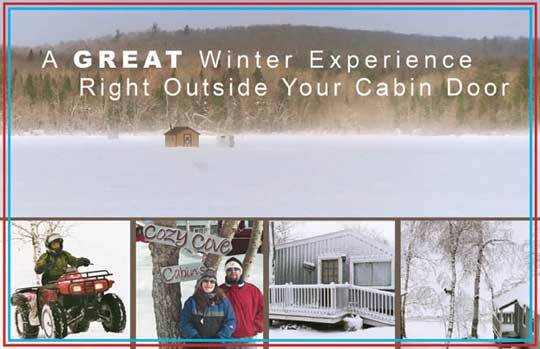 The [url=http://cozycovecabins.com/maine-outdoor-winter.php]Jackman Snowmobile[/url] club (et al) have been working on the trails…getting ready for a great winter season in Jackman Maine. Steve went out went with a few others this weekend to build, I think 6 bridges out on the trails. There are many streams in the area that the trails pass over and these bridges will help not only the sleds and ATV-s (some of these trails are part of the ATV system into Canada) but also maintian the natural flow of water throughout the winter. “”After moving to Me 7 years ago, I am finally taking a few days to explore Northern part of the state. ….Arrived in Jackman just before dark. Tomorrow I am headed for Baxter State park and the loop around Katahdin and eventually the shore. Things I-ve learned…. “”…It-s great to be here ❗ Loved the improvements in cabin 6. It was very nice to arrive at 7 and have the lights left on for us. The cabin truly is cozy-after getting the heater fired up. I adore the wicker settee on the porch; a great place to snooze, read, watch the lake, snooze, and write, read, knit, snooze. Very pleasant. Only a dusting but it is a start to what we hope will be a very snowy season! Most of the snow was gone by afternoon, at least around town. I am sure in the mountains, there is still some holding on. Time to get out the snowmobiles…well maybe not yet but at least get them tuned up! You can-t wait until the last minute. The water on Big Wood Lake has risen quite a bit after the rain storms we had this past weekend. I suppose that the ground could not handle the amount of water and most ran off into the lakes and streams. Our lower yard near the shore usually floods with the spring thaw but did also after this weekend-s rain. So now, we have a small pond where in the summer, we played volleyball. Anyhow, I guess these shallow waters now on our yard are appealing to the blue heron. I think this is what he was: Blue-gray in color, white neck and Long legsÃƒÂ¢Ã¢â€šÂ¬Ã‚Â¦. I saw him early this morning just before the sun came up but it was too dark to attempt a picture. Just now, he came back and was walking around the yard-pondÃƒÂ¢Ã¢â€šÂ¬Ã‚Â¦strutting his stuff, his long legs just barely in the water. What a gorgeous birdÃƒÂ¢Ã¢â€šÂ¬Ã‚Â¦so graceful. I assume he will be back to explore the new pond that developed but unless I set up a camera on a tripod and sit on the deck all day, I guess I will not be able to capture him on filmÃƒÂ¢Ã¢â€šÂ¬Ã‚Â¦but maybe! Steve is taking down a deck today. (before it snows) I think I will leave the camera with him. Just a reminder, Jackman Maine is beautiful in the winter. And there-s so much to do! The comittee for the Festival Sans Frontier, which is the “”Friends across the Border”” 4th of July Festival that is hosted by Jackman every other year, is gearing up for the 2007 festival. They are sponsoring a HALLOWEEN PARTY on Saturday October 21st in the Hall at John-s Four Season Accommodations. There will be decorations and a DJ playing oldies and country music only. Dressing up is optional. For more info and tickets, please contact Carol Bennett at 668-2011. If you are in the Jackman area that weekend, or if you plan to be here for the 4th of July celebration In 2007, come on over, bring a costume and support the Festival comittee. And for more Halloween fun…if you are in town October 28th, join the locals at the Northland! We love to have company/family visit us as it seems to be the only time we get out of camp and enjoy the area. Mind you, I am not complaining….we love being right here at CCC and having Big Wood Lake as our backyard. We enjoy every moment, even if we are working! But we know there are so many adventures around the area to explore. As always, Nature just amazes me. Such simple natural beauty to be seen. We did take a couple pictures of the falls and of course each other which I will insert one here at a later date. Then we took a ride up Bald Mountain road looking for, what else, a moose! Of course we saw none….wrong time of day and I do believe they knew that moose season was about to start in the Jackman region! Miss Linda and Jim already!